9pm: Official result: PAS candidate Mohd Fauzi Abdullah has won the Manek Urai by-election by a majority of 65 votes. 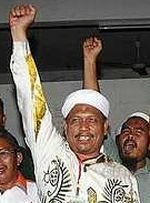 He garnered 5,348 votes against Barisan candidate Tuan Aziz Tuan Mat, who received 5,283 votes. Election Commission stops counting temporarily to await receipt of the five final ballot boxes. 8pm: Recount being held at respective polling stations due to slim majority of victory for polls winner. Sources say PAS candidate Mohd Fauzi Abdullah had won by less than 80 votes. 7.55pm: Sources say the race for the Manek Urai seat is close. Party sources from both Barisan and PAS claim they have won by a slim majority. 7.05pm: Ballot box from Manek Urai Baru first to arrive at tallying centre SMK Sultan Yahya Petra 1, followed by that from Sungai Peria dan Lata Rek. 5pm: Voting ends. Voter tunrout is 87.33%, with a total of 10,736 of the 12,293 eligible voters casting their votes. Results are expected about 8pm. 3pm: The crowds have eased at the polling centres after more than 80% of the electorate having cast their ballots. Traffic is still congested particularly at Kampung Peria heading to Manek Urai Baru. Police are managing the situation. Several representatives from election watchdog Mafrel were seen monitoring the situation at several polling centres. 2.30pm: Five Puteri Umno members were injured in a scuffle with rival party supporters outside SK Peria at about 10.30am. It is learnt that a police report has been lodged. 2.30pm: As at 1pm, a total of 9,359 voters (76.2%) have cast their ballots. 1pm: As at 12.30pm over 8,400 voters (70%) have cast their ballots. 12.45pm: Police have been diverting traffic into village roads to ease the congestions along main roads such as Kuala Krai-Gua Musang. 11.45am: Kelantan police chief Senior Asst Comm 1 Datuk Abdul Rahim Hanafi urged outsiders not to use the Kuala Krai-Gua Musang road if they do not have urgent matters to attend to. This would facilitate better traffic movement for the Manek Urai by-election. He said police would check on rumours of squabbles occuring at Barisan Nasional operations centre. No report made yet. He said it has been an incident-free process except for the traffic congestions. 11.45am: As at 11am, 7,085 voters (57%) have cast their ballots. 11am: Police say process smooth so far with the only reported incident being the verbal spat at SK Manek Urai Baru centre. 10.45am: Kuala Krai - Kota Baru road heavily congested. Cars jammed up the road over 10km between the Sg Peria and Pahi polling centres. 10:30am: As at 10am, over 4,700 voters (38%) had cast their ballots. 10am: Kelantan Umno deputy chief Datuk Dr Awang Adek Husin was at SK Manek Urai Baru for a walkabout and greeted supporters of both parties. 9.45am: The Election Commission confirmed that as at 9am, 1,932 voters (15%) had cast their ballots. 9.10am: An argument broke out between supporters of Barisan Nasional and PAS over space on the roadside at SK Manek Urai Baru. Policemen separated the two groups using tapes. Earlier, Barisan candidate Tuan Aziz Tuan Mat visited SK Manek Urai Baru and shook hands with supporters of both parties. KUALA KRAI: Polling day for the Manek Urai by-election started smoothly as voters arrived at the nine centres which opened at 8am Tuesday. The weather was cloudy in the morning. The rain is expected to stay away for the day. Kelantan Mentri Besar Datuk Nik Aziz Nik Mat visited the SK Peria polling centre at about 8am. He did not want to comment on the results but predicted a PAS victory. The Election Commission expects a turnout of 85% among the 12,293 voters who will choose between Barisan Nasional candidate Tuan Aziz Tuan Mat, 39, and PAS’ Mohd Fauzi Abdullah, 50. The election in this rural constituency was called following the death of Ismail Yaakob of PAS on May 22 due to a heart attack.